Beginning a little over one year ago, there have been quite a few developments that have positively impacted the economy. Many signs now point to a noticeable improvement in the economy's underlying growth fundamentals that bode well for the future. 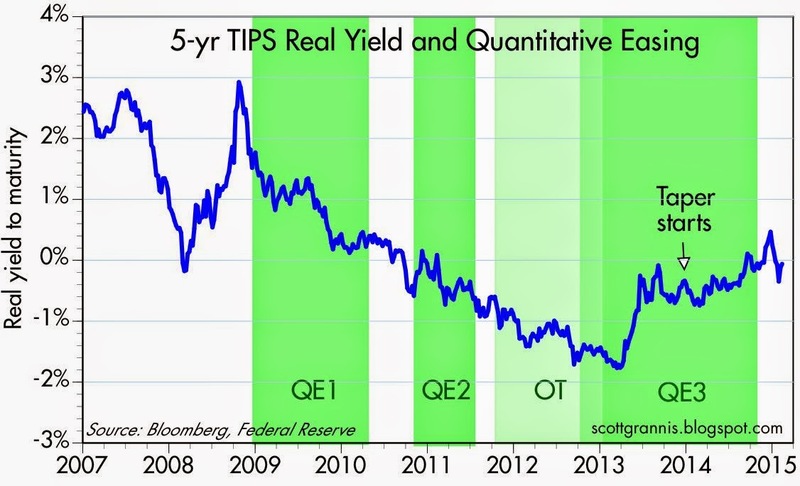 Swap spreads confirm that QE3 was successful. As the chart above shows, swap spreads rose significantly following the end of QE1 and QE2; that was a good sign that financial markets were still under a lot of stress—liquidity was scarce and systemic risks were still significant. 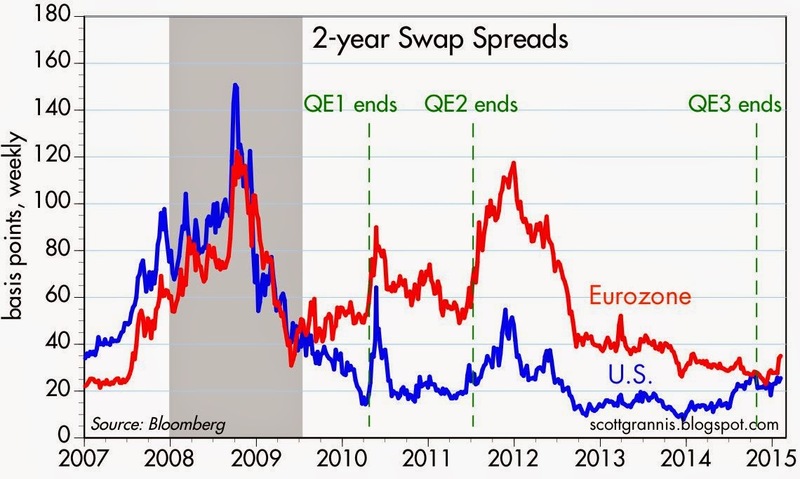 Today, more than 3 months after the end of QE3, swap spreads both here and in the Eurozone remain at benign levels. 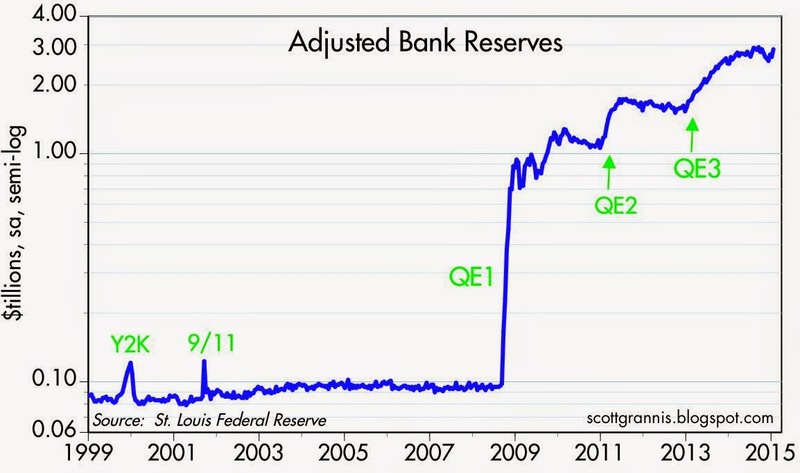 This suggests that financial markets are in good health, liquidity is abundant, and systemic risks are low. A healthier economy typically follows healthier financial markets. And indeed, the economy has improved over the past year. 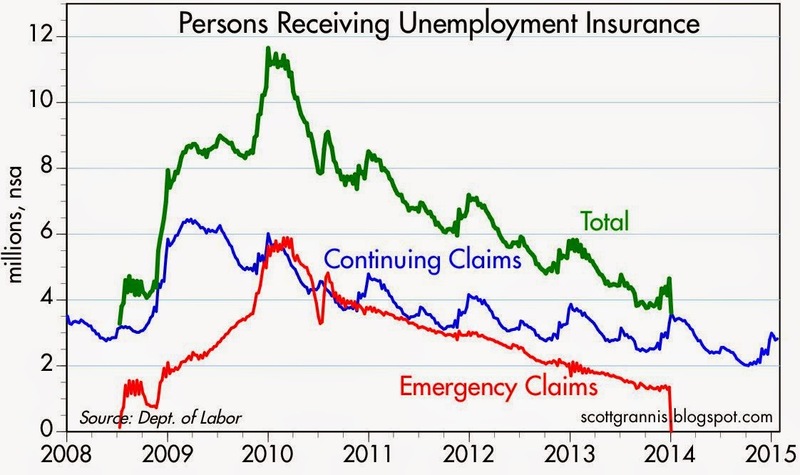 Congress allowed the Emergency Unemployment Compensation Insurance to expire at the end of 2013. Since then, the number of people receiving unemployment compensation has declined by almost 40%, as shown in the first chart above. 1.83 million fewer people today are "on the dole," while total employment has increased by 3.37 million and the labor force (those working and those looking for work) has increased by 2.13 million. 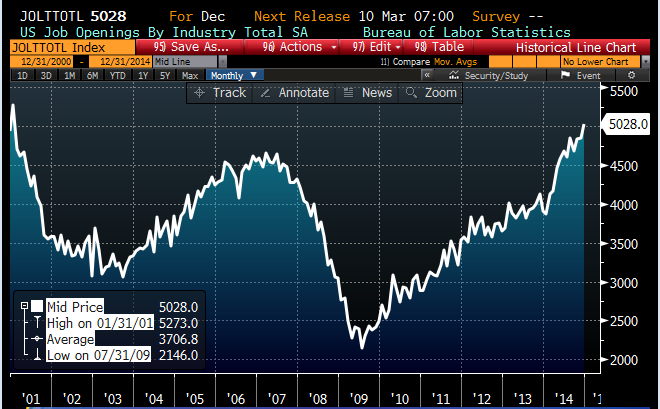 In the past 12 months, jobs have increased 2.33%, the largest such gain in the current business cycle recovery. It would appear that paying people for extended periods to not work was not a good way to stimulate the economy. Bank lending to businesses began to accelerate early last year. 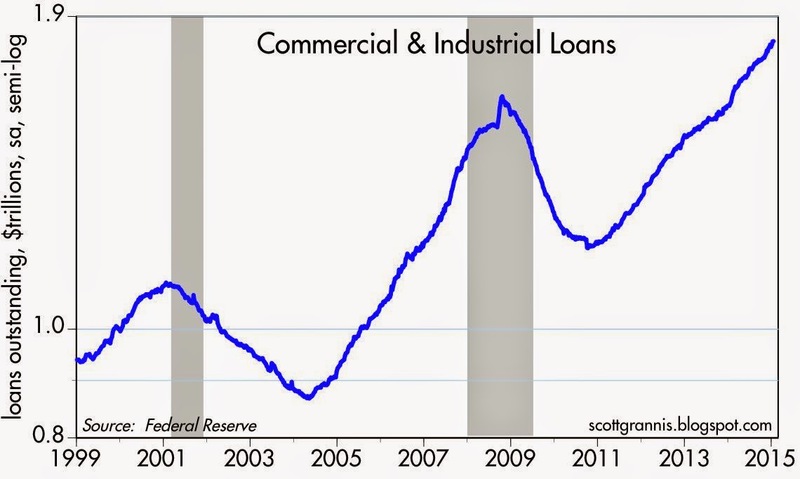 Commercial and Industrial Loans, shown in the chart above, are up $221 billion since the beginning of last year, for a gain of 14%. In the past three months, C&I Loans have increased at an annualized rate of 13.5%. Bank lending is up by $855 billion since early last year, a gain of 8.6%. 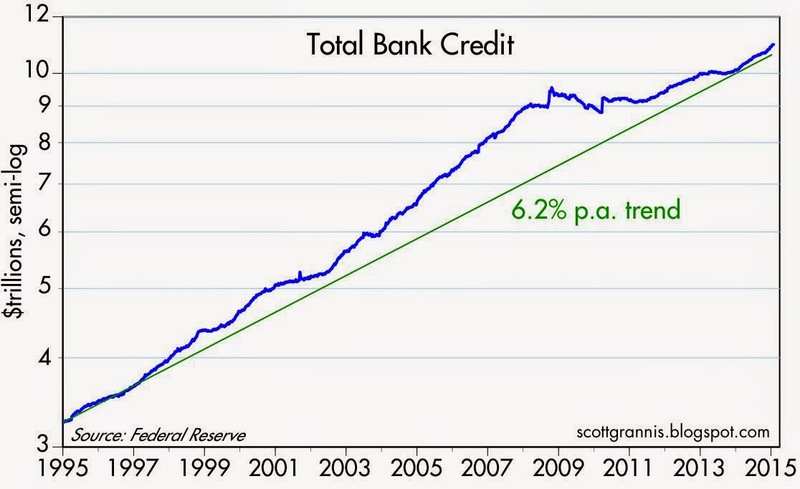 Over the past three months, bank credit has grown at an annualized rate of almost 12%. That's by far the fastest growth in bank lending since the Great Recession. The faster pace of bank lending is a good sign of rising confidence. Banks are more willing to lend, and businesses are more willing to borrow. 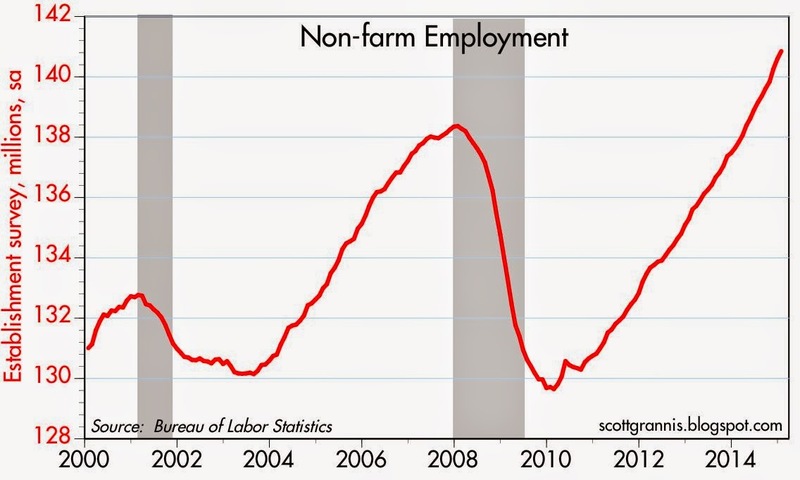 It should not be surprising, then, to see that job openings have surged more than 25% in the past year, as shown in the chart above. Private sector businesses, the source of most of the economy's underlying strength, are expanding at a faster pace than at any time in the past 5-6 years. 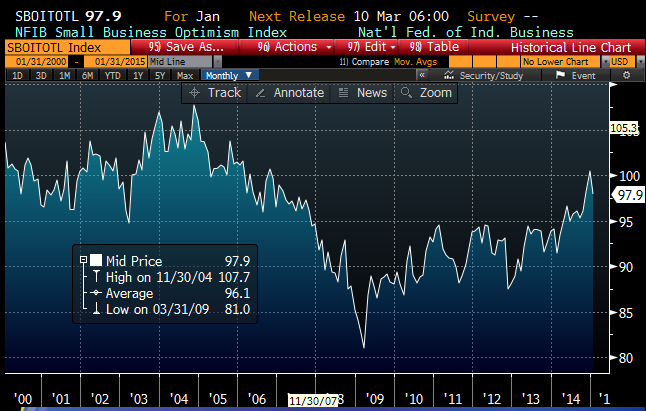 The chart above shows an index of small business optimism. It has picked up noticeably, starting about a year ago, and this is consistent with the pickup in business lending and hiring. Lest I be mistaken for an Obama supporter—especially one desperate to show that the economy is improving—let me reiterate that I think Obama's policies (which have greatly increased tax and regulatory burdens, while focusing on redistributing income rather than rewarding work and risk taking) have amounted to significant headwinds which have retarded the economy's progress for the past six years. That the economy is doing somewhat better over the past year is testimony not to any improvement in fiscal policy but rather to the U.S. economy's inherent dynamism. The economy is doing better in spite of Obama's efforts to punish success, not because of them. Of course, the pickup in growth this past year is still a drop in the bucket. 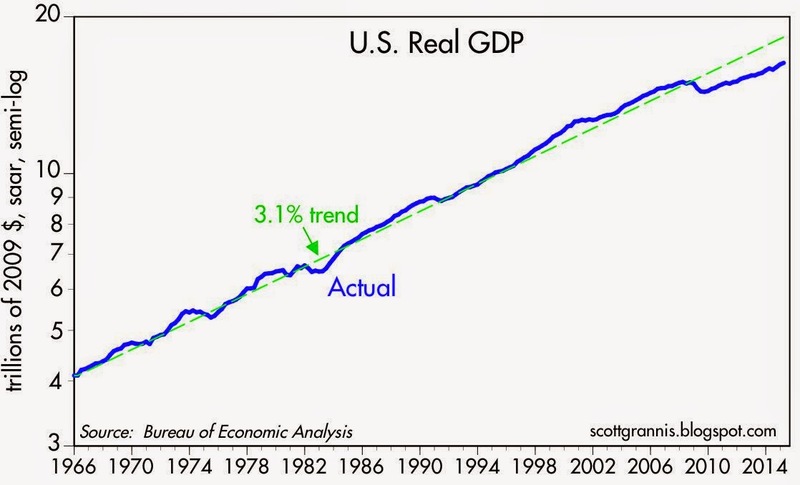 As the chart above shows, the economy is still more than 10% below where it could have been if this had been a "normal" recovery. The shortfall in growth is significant, equal to about $2 trillion in lost income every year. That's the equivalent of over $12,000 per year for every member of the economy's labor force. It's been the worst recovery in history, but that shouldn't obscure the fact that the economy's underlying fundamentals are improving. Unemployment compensation is becoming a lesser-issue. There are now more people receiving VA monthly "disability" payments than unemployment insurance. SSDA is a problem too.